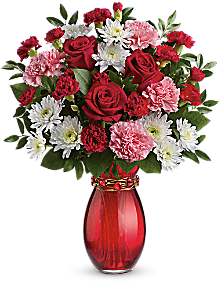 This Valentine’s Day, send a beautiful bouquet from Teleflora’s Get A Room Collection to be entered for a chance to win $25,000 for the ultimate man cave or dream room of your choice. Flowers for her. A man cave for you. 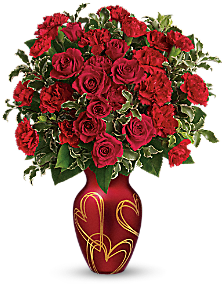 Everybody gets lucky in the Teleflora’s Get A Room Sweepstakes! 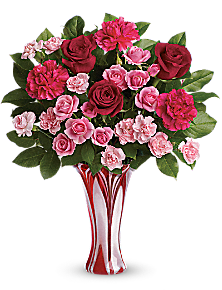 During the sweepstake entry period, visit Teleflora.com and purchase/send any eligible Teleflora bouquet to automatically be entered into the sweepstakes. You will receive one entry for each successfully completed transaction, regardless of the number of items purchased during the transaction. For this reason, we recommend that you purchase the eligible bouquets one by one (if you want to purchase more than one) to improve your chances of winning. 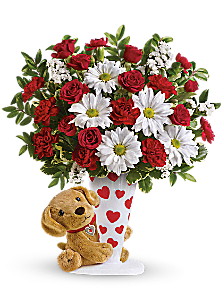 Eligible Teleflora Bouquets: Teleflora’s Sweet Embrace Bouquet (T15V100A), Teleflora’s Swirls of Love Bouquet (T15V200A), Teleflora’s Hearts of Gold Bouquet (T15V300A), Send a Hug I Ruff You by Teleflora (T15V400A)). You may enter by mail as often as you like, which is a huge advantage over the purchase method. This sweepstakes started at 12:01 a.m. ET on Monday, January 19, 2015 and will conclude at 11:59 p.m. ET on Friday, February 13, 2015. The Teleflora’s Get A Room Sweepstakes is open only to legal residents of the fifty (50) United States and the District of Columbia and Canada (except Province of Quebec), who as of the date of their entry into the Sweepstakes are eighteen (18) years of age or older.